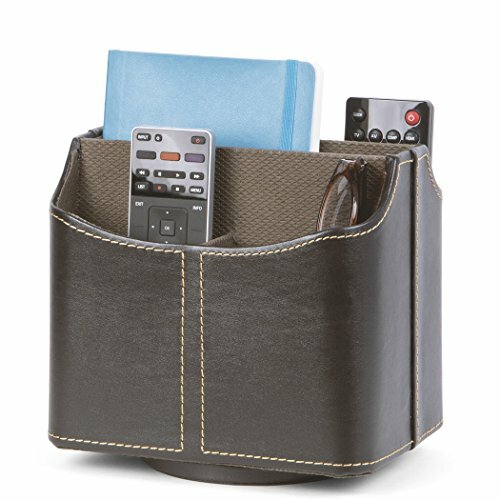 The Brown remote control organizer brings both function and style to your living room, bedroom, dining room, etc. Featuring a perfectly formed and convenient shape allows for easy access to any of your remotes in a comfortable and easy fashion. End the frustration of having to look for remote controls when you need them, and not have to look for them all over the room and even between sofa seats or under sofas, and more. The 4 small sections hold anything from remote controls to pens and whatever you can think of. the larger inner section is perfect for small periodicals and television magazines. Works great on desks, tables, coffee tables or simply place it on your TV stand - As well on your vanity and bathroom counter to keep your brushes, eyeliners and palettes within easy reach. Tired from a long day's work and want to put your feet up and watch the game Then this organizer box is your best choice for a relaxing hassle free experience. has the perfect inner storage space for you to place your phone so you know exactly where it is or use it as a handy place to keep your iPad or tablet. with your new organization in a decorative and fashionable brown remote control organizer that will complement the stylish decor of any modern home. This was manufactured with the customer in mind, to make sure you will have the best experience with our goods. See it for yourself by buying today by clicking on "Add to Cart"